Siesta Key Beach is right next to Tropical Breeze Resort and has an avid beach volleyball community that attracts locals and visitors alike year-round for games in some of the softest sand in America. The structure of the sand on Siesta Key is 99 percent quartz, making it cool to the touch and perfect for long volleyball matches. Siesta Key Beach was also recognized by the Travel Channel and the Great International Sand Challenge for having the “whitest and finest” sand in America. With the fine powdered sand, gorgeous scenery and a sun drenched setting, there’s no better place for competitive volleyball than Siesta Beach. The sand courts are south of the concessions on the beach, and with many sand courts to choose from and friendly locals, it is not uncommon to start a spontaneous game of volleyball. If there is a game in progress, you can always ask to join in. You’ll find people playing both competitively or just for fun. 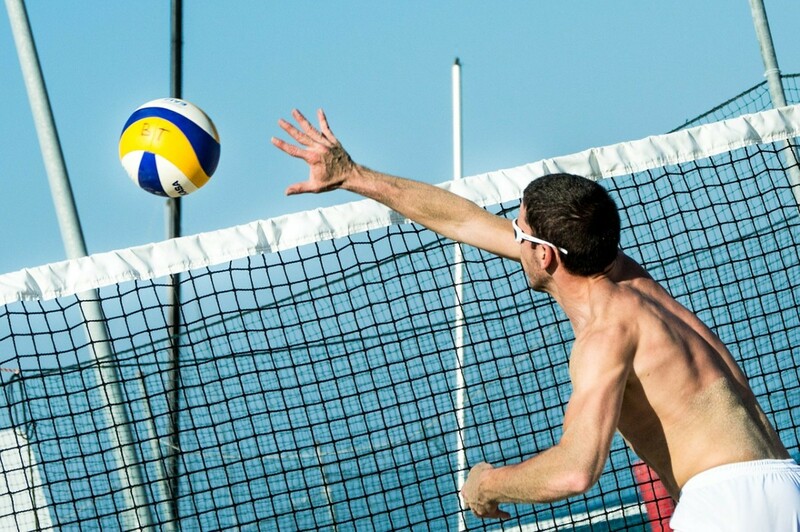 If volleyball on Siesta Beach interests you, but you haven’t played outdoors before, there are a few differences compared to indoor volleyball to note beforehand. Coaching is not allowed in outdoor volleyball. Outdoor volleyball also incorporates overhead touches and tips and block counts as a team touch. In outdoor volleyball, hand signals are a clever, discreet method for special cues for the team’s advantage. Incorporating a “block signal” out of sight behind a player’s back is a great way to communicate a defense plan against the opposing team. The signal is given by the serving player’s partner before serving the other team. Both hands are used and the way they are made indicates different ways they’re planning on blocking. A “line” attack is performed with one finger and indicates the blocker should block an opponent’s “line” of attack, or a ball hit perpendicularly from the net and parallel to the sideline. An “angle” attack is performed with two fingers and indicates the blocker should block an opponent’s “angle” attack, or a ball hit diagonally from the net across the court. A “ball,” is performed when the hand is open. The blocker will block “ball,” with this signal, and the team will base their next move off the opposing team’s set and technique. A “pull-off” is performed with a closed fist and indicates that no block should be performed against the opposing team. If you need a break from the sun after your match, be sure to bring a towel and take a quick swim! You can also choose from a variety of watersport options including fishing, boat tours, swimming, jet skiing, parasailing and much more. There are also a wide variety of concessions available for the public’s convenience during matches. If you have any questions at all about volleyball on Siesta Beach or quality accommodations near the beach, contact Tropical Breeze Resort today at (941)-349-1125.